Businesses turn to social media platforms like Facebook, Instagram, and Snapchat to advertise their products and services, and for good reason. In 2021, it’s estimated that there will be 3.02 billion social media users in the world. A large percentage of Internet users regularly go on social media networks and this percentage is expected to grow. Running a contest is one of the best ways a business can use social media platforms to connect with their audience, boost awareness for their brand, and generate genuine value from their followers. Most contests hosted on social media are straightforward and easy to start and run. However, there are several different types of social media contests to choose from. Most of which are distinguishable by the means of entry. You should consider the advantages and disadvantages of each type of contest to ensure yours will generate the right type of interest and value for your business. Like to Win Contest – The “Like to Win” contest is one of the most widely used types of contests on Facebook and Instagram. The winner is randomly selected from all the users who like a post on the chosen social media platform. 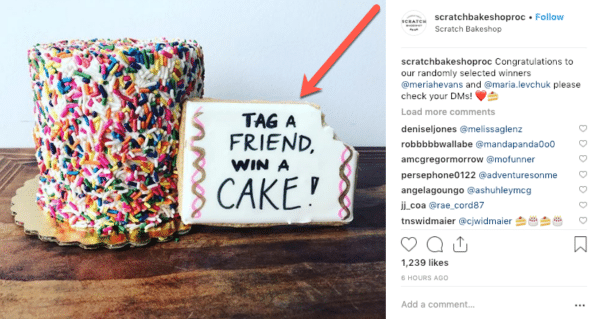 Comment to Win Contest – The “Comment to Win” contest is a great choice for brands that are looking to incentivize engagement on their social profiles. The winner is randomly selected from all the individuals who comment on a social media post. Caption Contest – A caption contest is a type of “Comment to Win” contest that allows users to come up with unique and witty captions for a photo. Brands could run this type of contest to get feedback from fans about whether they like a new product or service or to brainstorm ideas for a new slogan. A “Comment to Win” contest is easy to set up. All you need to do is share a link, photo, video, or even just a status update on social media. The rules of the contest as well as the deadline for entering. 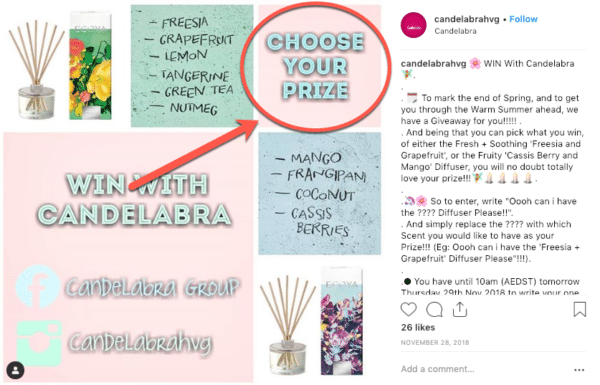 Example of a call-to-action for a contest in an Instagram post. An innovative way of showing a contest prize in a photo. The number of winners you plan on selecting – this will depend on the value of the prize and the size of your target audience. Generally, if you only have one prize on offer then it may deter people from entering because they will feel as if they have no chance of winning. That’s all you need to do to have your “Comment to Win” contest up and running. If this style of social media contest is easy to set up, then it’s even easier to enter. All participants need to do is comment on your post for the chance to win, it will take them no more than 30 seconds. As a result, these types of contests tend to attract a significant amount of participation from fans. You can opt to allow fans to comment with whatever they want or you can ask them to answer a question or prompt. For example, if you sell watches, you could post pictures of a selection of your watches and ask your fans to comment with which watch they like the most. Each comment can serve as an entry to win a watch. Of course, you will enjoy the advantages of drawing attention to your brand and your products as well as understand more about which product your fans like the most. “Comment to Win” contests are built for high engagement levels. By design, they encourage users to actively interact with your social media post by commenting. Quite often you will have people tagging their friends and family in the comments too if the prize is something they are inclined to want or need. This increased engagement and interaction between users creates momentum for the contest and can send it viral. 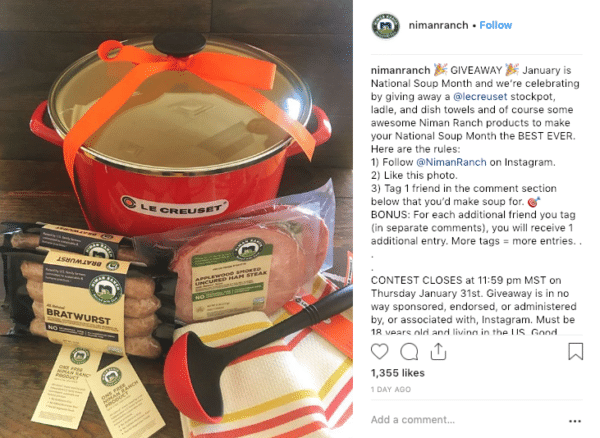 For example, this contest from Niman Ranch, a brand with only 7.5k followers on Instagram, has 3.7k comments and 1.3k likes! The power of “Comment to Win” contests. There is a tipping point whereby a post takes a life of its own, it gets picked up by the algorithm and before you know it, it goes viral. This is the undeniable power of “Comment to Win” contests. The final benefit of “Comment to Win” contests is the insights they can provide your brand. The watch example I used earlier is a great representation of this. By asking users to vote for the products they like the most by commenting, you are gathering valuable data from your ideal prospects. You can adapt future contests accordingly and even influence product development in a direction you never thought possible. A “Choose your prize” contest example. 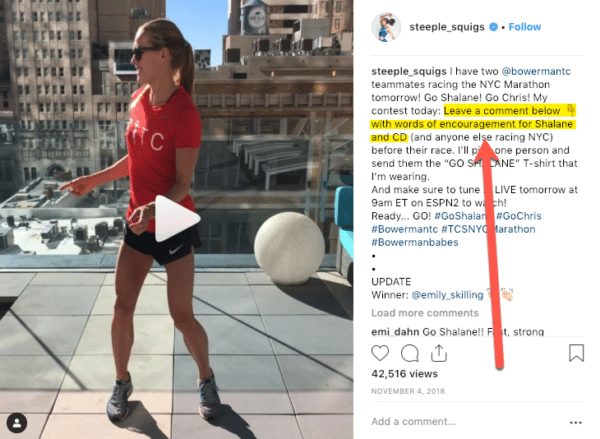 When it comes to running a “Comment to Win” contest the main thing you need to consider is how to actually use Facebook and Instagram comments as contest entries. Fortunately, there is software on the market that you can use to make it easy to use comments as contest entries. 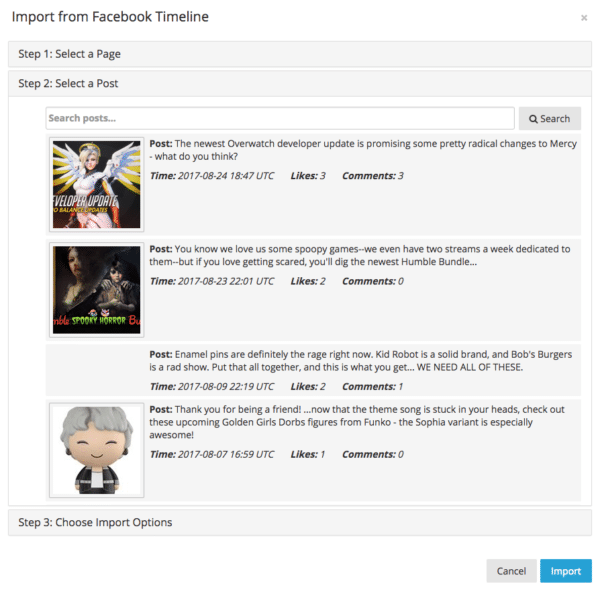 For example, ShortStack allows brands to import comments and likes from Facebook into a list. The importer is able to collect information, such as the name of the user on Facebook, the ID number of the user, and the content of the comment. You can import both text and photos from the comment. Importing data from your Facebook timeline in ShortStack. How to import likes and comments using ShortStack. You can also decide whether you would like to accept multiple entries from the same user. If you decide to allow multiple entries, it is a good idea to set a limit to prevent abuse and cheating. Using ShortStack, you can also import the comments of an Instagram post into a list. The importer will collect information such as the content of the comment and the Instagram username. 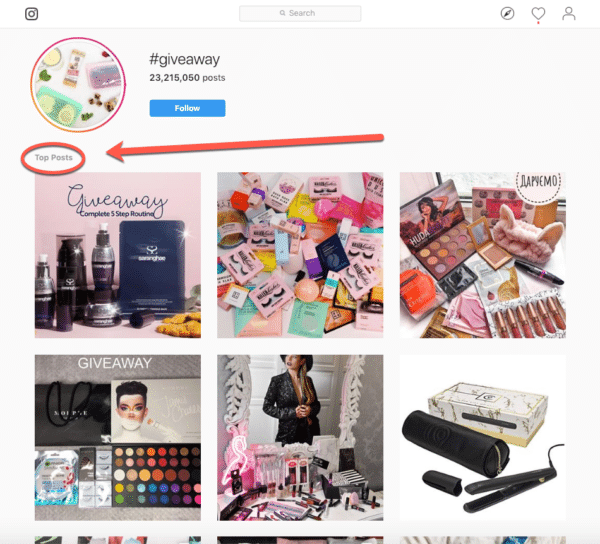 Then, if you want your contest to run simultaneously on both Facebook and Instagram, you can use the ShortStack Entries Manager to choose a single winner from two different lists, making it easier for you to select a winner in a fair manner. This is a HUGE time-saver, right? The number of social media users is expected to increase significantly in the next few years. Undoubtedly, social media is here to stay and contests are a proven way to leverage these platforms for increased engagement, brand awareness, customer insights, and lead generation. For more information about how you can use Facebook and Instagram comments as contest entries, don’t hesitate to contact us.